By the Sky and the Night-Visitant (therein)(1) And what will explain to thee what the Night-Visitant is? 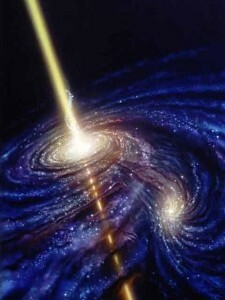 (2) (It is) the Star of piercing brightness. (3) There is no soul but has a protector over it. The basic difference between a star and a planet is that a star emits light produced in its interior by fusion reactions (nuclear `burning’), whereas a planet only shines by reflected light. Sun is our own special star yet, as stars go, it is a very average star.There are stars far brighter, fainter, hotter and cooler than the Sun. Basically, however, all the stars we can see in the sky are objects similar to the Sun. The Sun (and any other star) is a great ball of gas held together by its own gravity. The force of gravity is continually trying to force the Sun towards its center and if there were not some other force counteracting it, the Sun would collapse. The necessary outward pressure is produced by the radiation from the nuclear energy generation in the Sun’s interior. 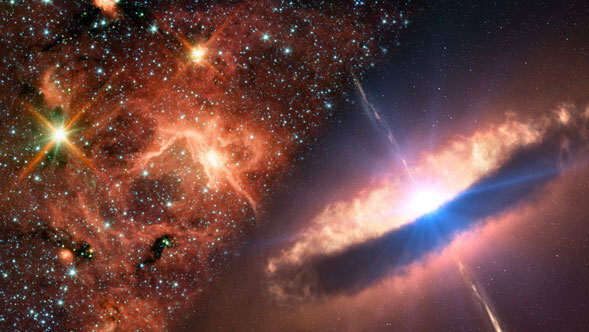 In its early stages the embryo star is still surrounded by the remains of the original gas cloud, from which it formed. By this stage the cloud remnant takes the form of a disk around the star. The radiation from the star gradually dissipates this disk, possibly leaving behind a system of smaller objects, planets. The star now settles down to a long period of stability while the hydrogen at its center is converted into helium with the release of an enormous amount of energy. This stage is called the main-sequence stage, a reference to the classical color-magnitude or Most stars lie in a well defined band in the diagram and the only parameter that determines where in the band they lie is the star’s mass. The more massive a star is the quicker it `burns’ up its hydrogen and hence the brighter, bigger and hotter it is. The rapid conversion of hydrogen into helium also means that the hydrogen gets used up sooner for the more massive stars than for the smaller ones. For a star like the Sun the main-sequence stage lasts about 10,000,000,000 years. 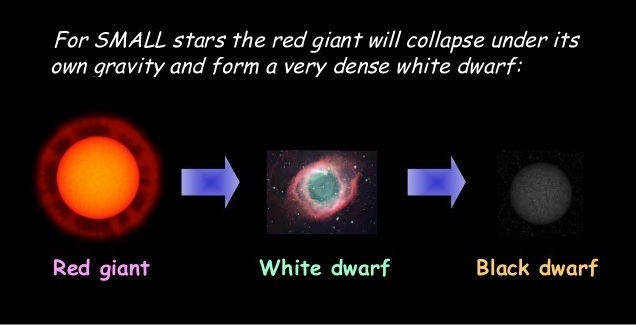 Whereas a star 10 times as massive will be 10,000 times as bright but, will only last 100,000,000 years. A star one tenth of the Sun’s mass will only be 1/10,000th of its brightness but will last 1,000,000,000,000 years. Stars do not all evolve in the same way. Once again it is the star’s mass that determines how they change. MEDIUM MASS STARS: Stars similar in mass to the Sun `burn’ hydrogen into helium in their centers during the main-sequence phase, but eventually there is no hydrogen left in the center to provide the necessary radiation pressure to balance gravity. The center of the star thus contracts until it is hot enough for helium to be converted into carbon. The hydrogen in a shell continues to `burn’ into helium but the outer layers of the star have to expand. 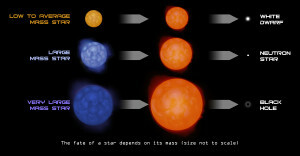 This makes the star appear brighter and cooler and it becomes a red giant. SMALL MASS STARS: Our knowledge of the evolution of these stars is purely theoretical because their main sequence stage lasts longer than the present age of the Universe, so none of the stars in this mass range has evolved this far! We believe that the evolution will proceed as for the medium mass stars except that the temperature in the interior will never rise high enough for helium `burning’ to start. HIGH MASS STARS: There are very few stars with masses greater than five times the mass of the Sun but their evolution ends in a very spectacular fashion. 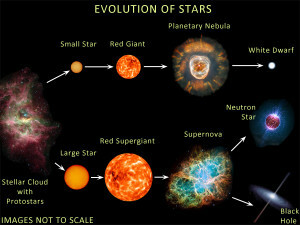 As was said above, these stars go through their evolutionary stages very quickly compared to the Sun. Like medium mass stars, they `burn’ all the hydrogen at their centers and continue with a hydrogen `burning’ shell and central helium `burning’. They become brighter and cooler on the outside and are called red supergiants. Carbon `burning’ can develop at the star’s center and a complex set of element `burning’ shells can develop towards the end of the star’s life. During this stage many different chemical elements will be produced in the star and the central temperature will approach 100,000,000 degrees Kelvin. Stellar-mass black hole is located near large active regions of star formation in the Milky Way, that spans some 700 light years across. collapses. When this happens, it causes a supernova. A supernova is an exploding star that blasts part of the star into space. 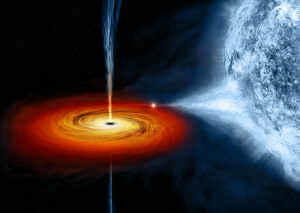 A black hole is a geometrically defined region of spacetime exhibiting such strong gravitational effects that nothing—including particles and electromagnetic radiation such as light—can escape from inside it. The gravity is so strong because matter has been squeezed into a tiny space. This can happen when a star is dying. Because no light can get out, people can’t see black holes. They are invisible. Space telescopes with special tools can help find black holes. The special tools can see how stars that are very close to black holes act differently than other stars. During this explosive phase all the elements with atomic weights greater than iron are formed and, together with the rest of the outer regions of the star are blown out into interstellar space. The central core of neutrons is left as a neutron star which could be a pulsar Star. What is remarkable about this is that the first stars were composed almost entirely of hydrogen and helium and there were no oxygen, nitrogen, iron, or any of the other elements that are necessary for life. These were all produced inside massive stars and were all spread throughout space by such supernovae events. We are made up of material that has been processed at least once, and probably several times, inside stars. The basic building blocks of atoms are protons neutrons and electrons. Protons and neutrons can be split into quarks but this takes place at energies higher than are found in stars. The binding energy of atomic nuclei plotted against the atomic number of the nuclei. Energy is released by the fusion of light elements into heavier elements (elements on the left) or the fission of heavy elements into lighter elements (elements on the right). Iron is the highest element on the graph, and the most stable. It cannot release energy through either fusion or fission. Protons carry a positive charge and reside with neutrons in the nucleus of an atom. At room temperature the atom contains the same number of electrons as there are protons in the nucleus, which makes the atom electrically neutral. It is the electrons that define the physical and chemical properties of the elements as we experience them on Earth. An atom of hydrogen has one proton and one orbiting electron while an atom of iron-56 has 26 electrons surrounding a nucleus containing 26 protons and 30 neutrons. The normal notation is 56Fe. It is the number of protons that defines the identity of an element. For each element the number of neutrons can vary and atoms with the same number of protons but differing numbers of neutrons are referred to as isotopes. For example iron has stable isotopes with 28, 30 and 31 neutrons. The neutrons and protons are held together in the nucleus by the ‘strong force’. The strong force only acts over very small distances but is able to overcome the electrostatic repulsion between protons. The most tightly bound nuclei are those close to iron in the periodic table of elements. The tightness of this binding is measured by the binding energy per nucleon where ‘nucleon’ is a collective name for neutrons and protons. It is also sometimes called the mass defect per nucleon. This reflects the fact that the total mass of the nucleus is less than the sum of the mass of the individual neutrons and protons that formed the nucleus. The difference in mass is equivalent to the energy released in forming the nucleus. The graph plots binding energy as a function of atomic number or number of nucleons per atom. The general decrease in binding energy beyond iron is caused by the fact that, as the nucleus gets bigger, the ability of the strong force to counteract the electrostatic force between the protons becomes weaker. The peaks in binding energy at 4,8,16 and 24 nucleons is a consequence of the great stability of helium-4 a combination of two protons and two neutrons. The maximum binding energy at iron means that elements lighter than iron release energy when fused. Elements heavier than iron only release energy when split, as was the case with the plutonium and uranium used in the first atomic bombs. Elements heavier than iron are made in stars by capturing neutrons onto atomic nuclei. This takes place in some red giants and in supernovae explosions. A new isotope is created when an atom captures a neutron. If this isotope is unstable then a neutron can convert into a proton, releasing an electron. This is called beta decay and is a form of radioactive decay also observed on Earth. By converting a neutron into a proton the atom has increased its atomic number by one and become the adjacent element in the periodic table. It may then capture another neutron, and so on, so that using iron as seed nuclei it is possible to build all the elements heavier than iron in the periodic table. The difference between element synthesis in red giants and supernovae is that in supernovae the flux of neutrons is greater and it is possible for the atom to capture a second, or third neutron, before it has a chance to beta-decay. This leads to the production of a different set of elements to those produced in red giants, where the flux of neutrons is much less.